"I am here. And I deny you all." There's deep beauty to aging gracefully. Grey hairs and stooped back, the gnarled fingers of arthritis look like tree roots. Graceful aging seems easy when it's Gandalf, Dumbledore, or Meryl Streep, yet so distant when it's a grandfather with 13 years of Alzheimer's. A grandmother who wakes up with a wet puddle in bed is like a helpless, overgrown infant who has little choice in the matter. And at that point it doesn't matter, really, whether it's graceful or not. It's just aging. 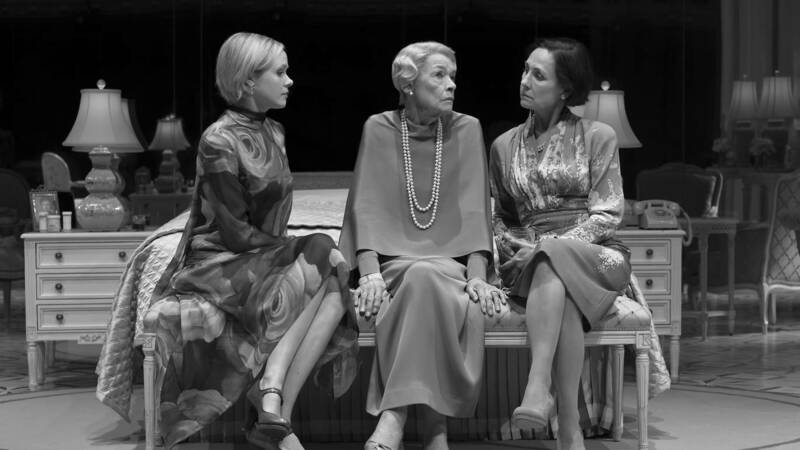 The magnificent tour de force that is Edward Albee's Three Tall Women is a paean to aging, gracefully or not. It opens on three women of unknown relationship, each clearly outlined by the trials and choices of he life. Left unnamed, we are able to cast them any way we choose, and refer to them only as A, B, and C (oldest, middle, and youngest respectively). C, played by a bright-eyed Alison Pill, is an ambitious and high-powered lawyer who makes us cringe with her canned and recited quasi-activist vibes. "I'm a Democrat, I notice a lot of things," she claims, and the two older women sigh. They know she'll notice a lot more in the coming years. B, on the other hand, acts with patient irritation and lenient indulgence of her older client. She is the caretaker, motherly, perfectly cast between ambition and senility. Laurie Metcalf, listening to the run-on reminiscences of an older woman on the verge of dementia, perfectly toes the line between wistful, lackadaisical glances out the window and fully responsive caretaking when these anecdotes are interrupted by a leaking bladder. She's ideally suited to acting bored while a deep undercurrent of care holds the entire mechanism together. Finally, A is the embodiment of age. Acted by the incomparable Glenda Jackson in what may be remembered as a seminal performance of the year, A is in the act of letting go. As soon as she remembers, she forgets. The audience laughs at her dementia (obviously, because of Jackson's perfect comedic timing), yet I'm reminded of my grandfather living for 13 years without knowing my name, and the laugh dies in my throat. 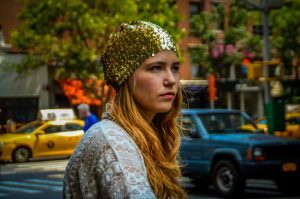 The first act is a meditation on aging that could live quite comfortably on its own; three women in vastly different stages of life compared to one another and then sent along their way. But with Mantello's brilliant direction and Miriam Buether's unbelievable set we are immediately transported to what feels like a snapshot in time. No more plot, no more narrative, but simply an hour of conversation. When the scene changed, I gasped. A clever trick with mirrors and a perfect dummy replica of Jackson asleep (or dead?) in bed opened up the play in two ways. First, in a literal sense, the stage appears twice as large, and the audience's reflection in the upstage mirror invites us to step right in. Second, the play opened in time. Instead of a narrative pathway extending horizontally before us, it was as if a giant beanstalk grew at the side of the road. If we ignored narrative, forgot story, and simply climbed up, our minds would open. One could argue that the second half opened the play in a third way: through the acting. Finally the actors were free to let loose, throw off their mantles of character, and be more fully themselves. The women are now the same person, merged into A, yet embodied at different ages. C is 26, B is 52, and A is 91. Though the casting left me unconvinced that these three could be the same person, that's besides the point. Through their words and stories, "I" became a plurality of "we". They share - or will eventually share - the same stories. There's no grandiosity in the process of aging, no excuse or empty soliloquy about becoming wiser. No - the play is more honest than that. Jackson's powerful line, "I am here, and I deny you all," is delivered with the gravitas of an atom bomb. She is whatever she is, and that is not for you to decide. Youth can be shaped by peers, a woman in middle age is shaped by circumstance, but in old age you are shaped only by yourself. In their ultimate discussion of happiness, I obviously felt closest to youth. The best must be yet to come, I thought, because, honestly, it hasn't been that great up until now. I must keep soldiering on, otherwise what was the point of all my youthful heartbreak. No, B argues, the best is in the middle, when you can look both back and ahead. This brings you joy. A makes the most compelling argument by claiming the happiest moment is at the end. "When it’s all done. When we stop. When we can stop." Jackson's delivery is not lecture, but a note of hope. There is so much still to look forward to, even as the lights, the play, and her life are brought to an end. During Three Tall Women, the deep beauty of aging gracefully resonated in every word and gesture on stage. I have never seen a performance like Glenda Jackson's, and perhaps I never will. The performance itself is a testament to Jackson's own golden age, as another jewel in a crown built from a long and studded career. Her performance shows us that it's not always beautiful - this business of growing old - but it is always present. Inescapable, confusing, dazzling, painful; the only thing certain about aging is that it happens. And, like A, if you can do but one thing, choose to age gracefully. Image courtesy Three Tall Women website. Photo by Brigitte Lacombe.